The book, as you may well have guess, was the Bible. Augustine picked up up. He read. And in reading the words of Saint Paul to the Romans, "all the shadows of doubt were dispelled." Fra Angelico's "Conversion of St. Augustine"
A recent story carried in the Washington Post (and other papers) reminded me of Augustine's "conversion" story. According to a recent study published in Science, a statistical majority of test subjects found it difficult to be alone with their thoughts for 6-15 minutes. Indeed, the majority of male test subjects preferred to be given low electrical shocks rather than sitting alone with their thoughts. The results of this study are hardly shocking, especially if you've ever tried to help people learn how to pray. Over and again I hear, "I can't pray! I can't meditate! I'd go crazy if I had to sit quietly for ____ minutes!" The idea of of just sitting frightens many of us and, in our hyper-connected age with sound-alerts and vibrating phones, it's no wonder. Yet I wonder if we might not adapt the child's voice Augustine heard. Instead of "Pick it up and read" perhaps we might say, "Pick it up and bead." And, by bead, I mean make use of the Rosary. You know, the Rosary: that thing that hangs from the rearview mirror of countless cars? That thing that snakes around the bottom of your purse or that's shoved to the back of your underwear drawer? That "necklace" people seem to be wearing as though it were a fashion accessory rather than a centuries-old prayer device? 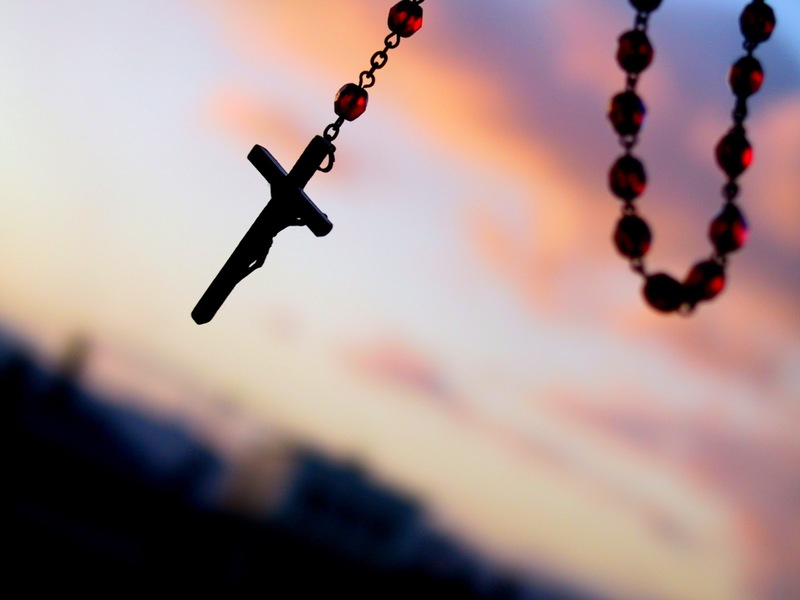 The nice thing about the Rosary, as a prayer aide, is that it gives you something to do: you keep count, there's a definite beginning and ending, it doesn't take terribly long, it's not always easy to do but it is relatively simple. In other words, Marechal detects the same difficult the authors of the Science article have picked up, but he's offering a different pathway through it. If we need stimulation, it's better to let a person use the Rosary and walk down the well-trod paths of long-memorized prayers. In his estimation, repetition of rote prayers does not hamper or retard spiritual growth but, in fact, actually mark a helpful first step in developing further an interior life. Prayer, like exercise, develops over time. Just as running a marathon is never easy, neither is sustained prayer ever simple. It takes discipline and effort: we need to discipline ourselves to relax into God's presence and friendship. The Rosary is one tried-and-true way of entering into the spiritual life, a venerable way of calming oneself and allowing the Mysteries of God's salvation to enter our hearts and lives. "Pick it up and bead, Pick it up and bead." It may be as much the next ad campaign for Hobby Lobby as it is the opportunity for each of us to defy the statistics and enter more deeply into our interior lives. "Pick it up and Bead." I love this.